Before I was advised to go on a gluten-free diet, one of my favourite outings with family and friends was to try out new restaurants. Going about my days now, as someone diagnosed gluten-intolerant, has made it harder to enjoy dining out. Before deciding on a restaurant, I have to study the online menu and sometimes call up the restaurant itself for more information about any gluten-free options they offer. Despite the fact that a number of restaurants around the island are offering gluten-free services, not all of them are aware of what it means to cater for someone with special dietary requirements. Offering a gluten-free pizza base but cooking it with all the other pizzas which contain gluten is a definite case of cross-contamination. Having gluten-free pasta readily available on the menu but not being sure whether the sauce that goes with it is safe for people adhering to that particular diet is also unacceptable. If you’re on a gluten-free diet, you are very likely to be faced by situations like these. If you’re a tourist, coming for a short visit to Malta, the last thing you would want to worry about is where, as someone gluten intolerant, you can safely dine around the island. A lot of elements in our Mediterranean cuisine involve fresh fruits and vegetables which are naturally gluten-free, but, unfortunately, you’ll have to avoid the majority of our typical Maltese food such as our famous Maltese bread and our mouthwatering beef olives. Clearly, we gluten intolerants, and others with special dietary requirements, need to choose our restaurants carefully. There are thankfully some safe options out there. The restaurants below are ones I’ve tested out and can vouch for as establishments that truly do know how to execute gluten-free meals. Valletta is probably one of the first places that you will wish to visit if you’re here on holiday, and after a full day of roaming around our beautiful capital city, you’re bound to get peckish. Bistro 516 is definitely a must if you’re looking for an enjoyable meal without having to worry if any part of a dish contains gluten. The owner of the restaurant is coeliac and, in turn, the staff are very well informed about how to handle customers with special dietary requirements. The first time I made a visit to this restaurant and informed them that I was gluten intolerant, the waiter carefully explained my available options from the menu. I was pleasantly surprised that I had the possibility of taking almost anything from the menu. There are even some dessert options for those gluten intolerants with a sweet tooth! If you’re in Valletta you might also want to try Palazzo Preca found in Strait Street or Aaron’s Kitchen in Archbishop Street. Bugibba and Qawra are two very popular places with tourists especially as there are a lot of hotels there. If you’re looking for a restaurant in this area, The Boathouse is your best option. It is the first restaurant in Malta whose catering is solely gluten free; meaning that no ingredient containing gluten can be found in this restaurant’s kitchen. You are free to choose anything from the menu with your mind at rest. I can definitely vouch for their pizza. It is absolutely divine and probably the best gluten-free pizza I have tasted on the islands. To top it all, The Boathouse has recently introduced a Chinese food menu which is also gluten-free! If you’re in Qawra you might also want to try La Nave at the National Aquarium for a homemade, gluten-free pizza. What better way to end a day filled with ferry trips and shopping in Sliema than dining with a view? You can find La Cucina del Sole at The Point where you can enjoy your lunch or dinner with an astonishing view of Marsamxett harbour. 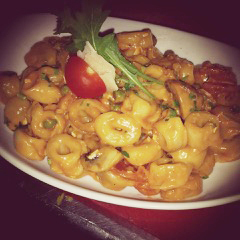 Your finest options from the menu are surely the pasta dishes. You can choose any pasta dish in a gluten-free version, and the sauces are also adjusted according to your special dietary needs. If you’re in Sliema you might also want to try La Cuccagna. If you’re in the mood for a tasty burger, try Cafe Cuba. Mdina is another touristic place not to be missed if you’re interested in old but exhilarating cities. If you’re there for lunch and you’re in the mood for a light snack, Fontanella offers a variety of gluten-free baguettes. However, Fontanella is mostly known for its heavenly cakes and, to our advantage, there are some delicious gluten-free options. A piece of gluten-free cake and a tall glass of hot chocolate make the perfect combination. If you’re in Mdina you might also want to try Ciappetti. 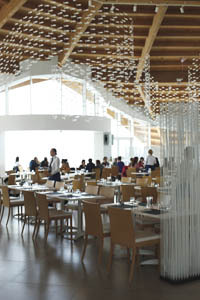 La Veduta in Rabat also offers gluten-free food where you can dine with a breathtaking view. As for the Maltese traditional ‘pastizzi’, you might be lucky enough to find gluten-free frozen ones in stock at some of the major supermarkets on the island such as Pavi in Qormi and GS Supermarket in Naxxar. Although dining out needs more evaluation when you have special dietary requirements, it is not impossible. These four restaurants/cafes are a few of the best that I found since I’ve been on a gluten-free diet. There is always room for improvement when it comes to knowing how to handle customers on a gluten-free diet but I think Malta’s definitely on the right track. Lyndsey Grima is a Masters Student of English at the University of Malta. This post was penned for us as a course assignment. When she’s not studying, you’ll find Lyndsey running her own accomplished blog over at ‘Splashes of Looks‘, a style, fashion & beauty space on local and international trends and products. I would think it’s pretty easy to avoid dairy products eating out. Maltese cuisine mirrors Italian which means it’s based on meat, fish, lots of fresh veg and salad. Just stick off the pastry items like our traditional snack Pastizzi (full off butter). If you can tolerate goats’ cheese, then a Maltese speciality cheeselet made of goat and sheep milk would be fine – they are called gbejniet. No need to order the Pannacotta for dessert! I was just wondering if you know how Malta is with dairy free diets? Hi June, to be honest, that’s a totally different matter and also a good point as I doubt many restaurants manage to cater for nut-allergy folk (ie, thinking seriously about cross contamination) but I might be wrong. Certainly, awareness raising on all these types of dietary needs is something we should do. I would think that if the establishments we’ve mention here are thinking about gluten-free needs, then they might be more sensitised to nut-free dietary needs too, but you’d need to grill them and drill down into any meal’s ingredients very carefully, irrespective of what the waiter might say. If you know of establishments offering bona fide nut-free dishes, then feel free to add in a comment here. Are any of the dishes nut free as well?